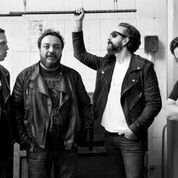 After almost two decades on stage, seven studio albums and more than 3 million copies sold, Molotov continues being one of the main spanish-speaking rock bands. Their debut album ‘ Dónde Jugarán Las Niñas’ in 1997 is considered one of the lasts latin-rock classic albums. Then, the success accompanied them as well with ‘Apocalypshit’ (1999) ‘Dance and Dense Denso’ (2003) and ‘Eternamiente’ (2007). After 7 years of silence, the Mexican band debuted as number one in the digital sales lists of the USA and Mexico with its last production ‘Agua maldita’ (2014), a work that was awarded as ‘ Best Rock Album’ at the Latin Grammy Awards this season.